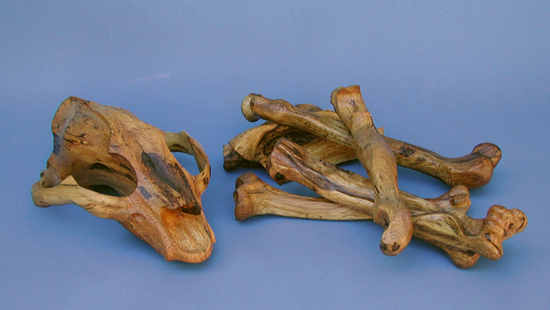 In All That Remains I have attempted to recreate representative skeletal pieces of the extinct California grizzly bear from the limbs and branches of a 300-year-old oak. Sculpting a shoulder blade, a pelvis, arm and leg bones, and a skull has been a profound experience for me.Working from photographs which I took at the Museum of Vertebrate Zoology at UC Berkeley, I tried to "know" every twist and turn, every thickening and thinning in the grizzly's bones. I have come to respect each as a nuance of elegance, as evolved perfection. My feeling of awe grew with each chip, grind and cut. Sculpting the bones was my opportunity to be an active witness to the impact that humans make on the land and to memorialize those species that lived and have died to "make way." The land we now inhabit and "transform" by partitioning, paving and building, was a wild domain not so long ago. As late as 1854, accounts of the Bay Area gave mellifluous descriptions of a fulsome, diverse world. There were many species of large mammals, herds of deer, antelope, and elk, flocks of millions of waterfowl and birds, rivers running with salmon. There were fruits and berries, oats, grasses, trees....Closing my eyes, I envision valleys and foothills populated by native plants and animals. There are California oak trees, providing shelter and food, enriching soil. There are California grizzly bears, mothers and cubs together, males foraging and hunting year-round in this "land of plenty. "In fact, there were so many grizzlies that the animal was chosen as the symbol of the "Bear Republic." Yet the California grizzly bear is no more. The animal was hunted and killed to extinction by 1922. My attempt to carve these skeletal remains in oak is itself a metaphor for extinction. The grizzly bones I create are not real. They are art. There is no way to bring back what is gone forever.